Flight Centre’s very own Amy got to walk the wonderful Beau, The Fairmont Hotel Vancouver’s 'canine concierge'. Beau is a friendly yellow Labrador who has lived at the hotel for nine years, and when guests want to explore the city they can volunteer to take Beau with them for a walk. The Fairmont Vancouver is a pet-friendly hotel, but Beau is there for those who aren’t able to take their beloved furry companions abroad with them. Miss Beau when you get home? Good job that he has his own email address so you can stay in touch. And if you're travelling around the USA and Canada, Beau is just one of a huge fleet of canine concierges across North America. We especially like the sound of Edie too, a white boxer/Labrador mix at Fairmont Pittsburgh. At the beautiful Thala Beach Nature Reserve in Queensland, you can watch Apple, the resident wallaby, hop through the lobby and the hotel grounds. Only in Australia, right? 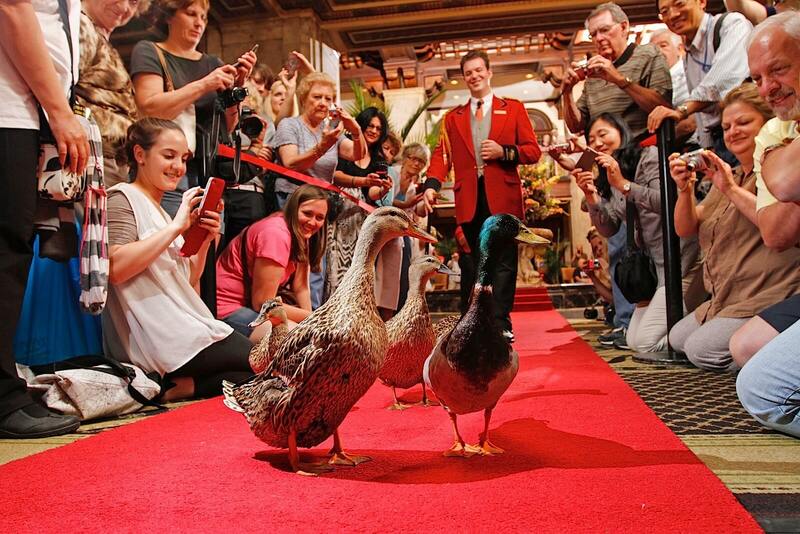 Whilst we’re on the topic of unusual guests, The Peabody hotel in Memphis, USA, has its very own flock of ducks. The origins of these feathered friends date back to 1933, when the then General Manager Frank Schutt had a bit too much Jack Daniel’s whisky. As a joke, live ducks were put into the hotel fountain and they were such a success that they stayed. That's when the job role for a 'Peabody Duckmaster' was created. Each day the ducks visit the lobby fountain at 11am and 5pm, and do their iconic Peabody duck march. Yes, the hotel is very proud of its ducks. Okay, so if you’re missing your cat, dog, guinea pigs or rabbits, the residents at the Grand Palladium in Mexico's Riviera Maya won’t be available for a cuddle, but they will offer a welcome distraction. 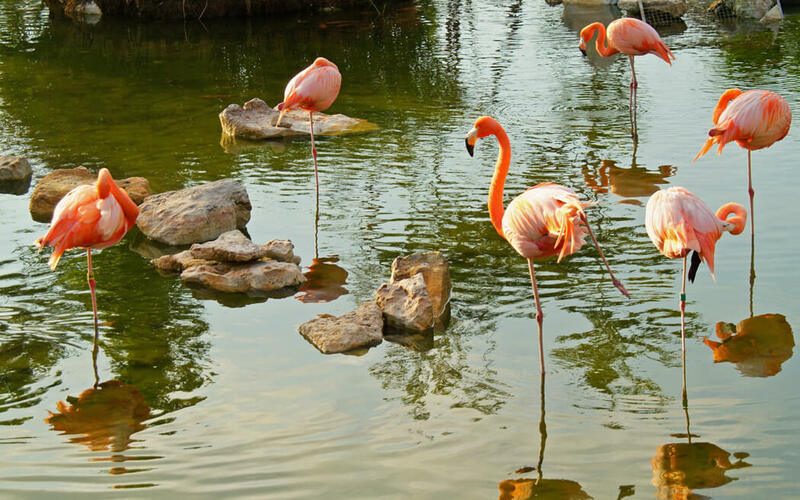 On the grounds of this luxurious resort, you’ll find a pink flamboyance of flamingos in two of the three lagoons. And who should be lurking in the third lagoon? Some exotic crocodiles! You truly get to experience wildlife from the moment you step foot outside your room. Naturally, to entice you to reach the end of this article, we’ve saved the best for last! If you’re a whizz at social media then you’ve probably seen the photos of a giraffe poking its head into a dining room whilst a family have breakfast. But, we can confirm, it’s not just a viral Photoshop image: it’s actually real! Officially one of the only hotels where you can feed a giraffe from your window, the Safari Collection-run Giraffe Manor sits on private land, home to roaming giraffes and friendly warthogs. Add it to your bucket list. Right now. Want to connect with animals on your next holiday? Speak to our Travel Experts about booking your stay in one of these wild hotels.